Born and educated in Edinburgh, where she gained an English degree. She first worked as a librarian, and later retrained as a primary school teacher. 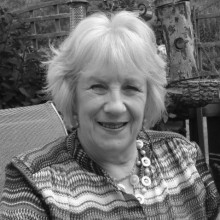 She worked for many years in England, and later in Greece, where she taught English and later became a travel representative, gift shop owner and editor of the local English language newspaper. Throughout this time she always had an interest in amateur dramatics, and was involved on and off the stage in numerous productions. All this experience, combined with teaching, dealing with the public and with clients, has made her a confident and clear vocal performer with a soft well-spoken Scots accent. A recent (successful) appearance on ‘Eggheads’ (S16 Ep 75), recorded in March, when she was encouraged by a compliment about her voice, crystallised Frances’s ambition to use her vocal talents professionally.